Notes: An absolutely beautiful tribal storage bag (one of a pair), with the dark burgundy madder hues (mixed with indigo?) typical of the type. This piece has six well-spaced Salor guls, but unusually these are interspersed not with shararch-palak minor guls, but by more minaturized Salor guls. Very finely woven, with intricate borders and elem that suggest a late 19th century or very early 20th century provenance. 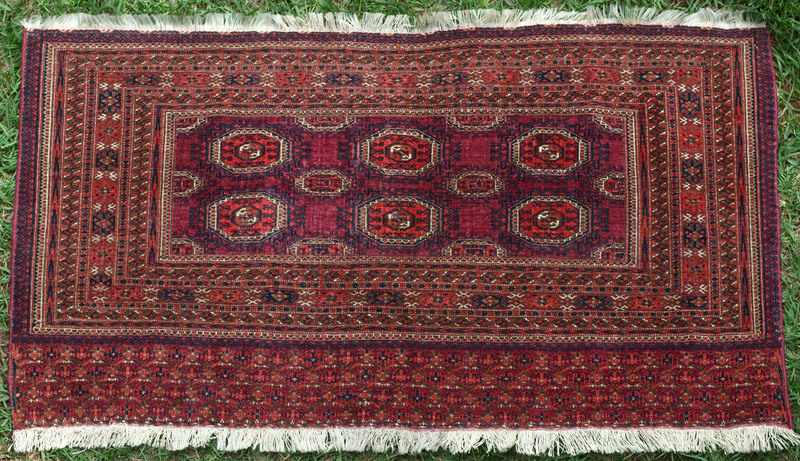 Persian/asymmetrically knotted (open to right) on nondepressed warps. It is difficult to find these in their original pair, and as an investment it is best to buy both.